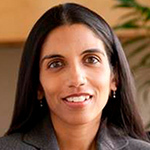 Asha Nayak, MD, PhD is Chief Medical Officer at Intel. She directs Intel’s healthcare investment strategy and provides clinical and business leadership to internal development programs. Her work focuses on genomics and imaging analytics, biosensors and wearables, and value creation from healthcare big data. She has led (as co-PI) four clinical studies that demonstrate the value of emerging Intel technologies in oncology and preventive cardiology. She also serves on the boards of several companies and organizations innovating in healthcare. Beyond her role at Intel, Dr. Nayak is an experienced physician, scientist, inventor, and investor. Her work was seminal to the development of brain MRI for stroke diagnosis and multiple interventional cardiology tools in use today. Prior to Intel, she was an investor at New Leaf Venture Partners, and created several new ventures within Medtronic. Career long, she has maintained an active clinical practice at the Stanford VA Emergency Department.